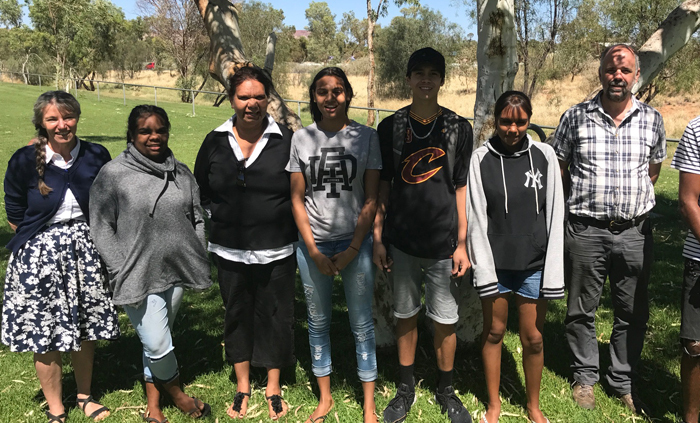 Centralian Senior College students are revitalising their language skills and taking pride in their Aboriginal culture by learning to read, write and work in both Arrernte and English. Harley Wallace, one of the Alice Springs students studying Arrernte as part of a vocational education and training (VET) course, said he was proud to be learning his own language in school. “I like learning Arrernte because it’s my language,” he said. With this year’s trials of a new Indigenous Languages and Cultures curriculum, the number of students studying an Aboriginal language in schools is set to increase. The new curriculum comprises four different pathways and offers schools and students a variety of options depending on their current level of Aboriginal language proficiency. David Moore, Linguist Alyawarr & Arrernte at the Alice Springs Language Centre, said language had become a hot topic for community discussion in the last 12 months. “Everywhere we go, they (the Elders) want to keep the language and culture strong because they want to hand on their culture and traditions to the kids,’’ he said. The new curriculum and guidelines for the implementation of Indigenous languages and Cultures programs in schools are part of a long-term plan for Territory schools to keep Indigenous languages and cultures strong.